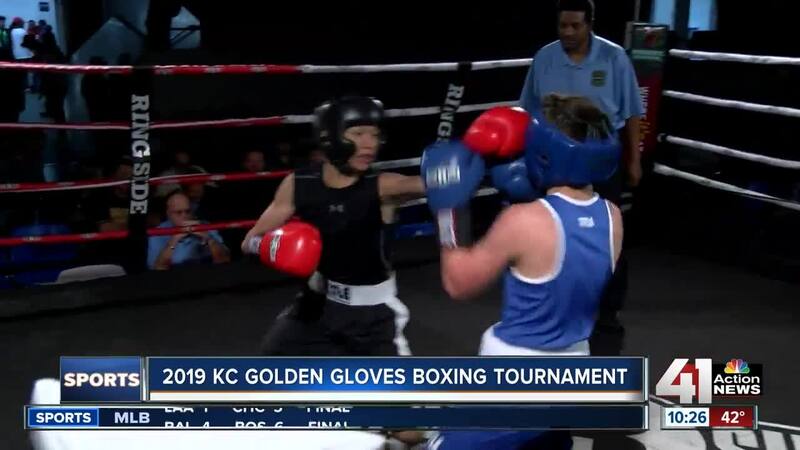 The 2019 KC Golden Gloves boxing tournament at Memorial Hall in KCK takes place April 11-13. The referree talks to Janette Molina (left) and Tamiyah Pittman (right) just before their semifinal bout on Friday. KANSAS CITY, Kan. — There are very few KC-area events that continue to stand the test of time while maintaining it's quality. The KC Golden Gloves tournament in KCK's Memorial Hall held their annual boxing showcase. The longstanding tournament started in 1936 and is widely regarded as the longest running sporting event in the area. The event takes place from April 11-13 and features male and female participants ages 13-39 looking to showcase their skills against the best boxers in the region. KC Golden Gloves president Chris Walden was certainly ecstatic for another fantastic turnout at the event. "We're definitely bringing up a lot of new talent. We just opened up a gym recently," Walden said. "You can come down here and get a ticket as cheap as $10 and see some of the best amateur boxers in the country. And, amateur boxing is a lot of action. They're three-round fights. There's no 12-round fight with 4 or 5 rounds of feeling each other out. So, it's a lot of non-stop action." 13-year-old Janette Molina is a young up-and-coming boxer who has been competing in the sport less than one year. She is part of the KCK Pal boxing team and is one of 260 kids that participate locally in amateur boxing. Janette is trying to show that she can compete with the best competition. "One of my goals is to be one of the best girls out there," Molina said. "And, [I want to] show all of my skills to everyone and not be scared, not be nervous. Just go out there and show my skills. Every day, when I get in the ring, [my coach] helps me. He tells me what to throw. And, he gets me somewhere. 16-year-old boxer Izak Carlos also wants to continue showcasing his skills. "For me, I always train. I train from Monday through Saturday. I always like watch my diet. And, I'm always training hard. I like spar. I run. I just stay in great shape," Carlos said. "When you get in the ring, you wanna control the fight. So, it seems like you're always winning. And like, you always wanna hit them more times than they hit you."